The Oklahoma State Department of Health has granted approval for Grady Memorial Hospital to repurpose the existing surgical area into Endoscopy and Minor Procedure Suites. 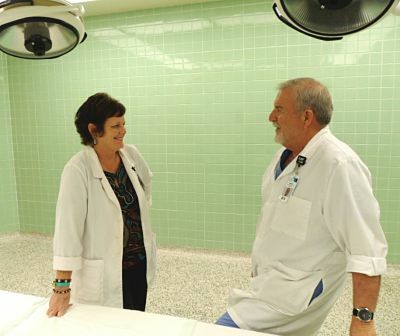 Cathy Groseclose, VP of Patient Services stated, "The OSDH Architect has approved our endoscopy repurposing plans. Demolition and construction will begin Monday, March 28. The state will have to come in, at 50% completion mark and at final completion, to bless the area so we can begin to do endoscopies." The repurposing of the Endoscopy area is a separate project from the construction of the new Surgery and Radiology Suites, which is projected for completion in 2017. The ability to do endoscopy and minor procedures in the interim will be greatly beneficial to patients in Grady County. Rocky Hodges, RN, Director of Surgery added, "It's been a long and complicated process to get to this point, but we couldn't be more pleased to begin construction. Once this project is complete, we will once again be able to provide endoscopy procedures, such as colonoscopies, and other minor procedures."